This is Part 2 of my post about how my husband and I work with couples to photograph their weddings in Durango CO. You can view Part 1 here . One of the things I missed in Part 1 concerns engagement sessions. As Photographers in Durango CO we love to do engagement sessions because then we are able to get to know our clients so much better and they get to know us as well. We have lots of fun and they have another special day to remember. Many of our clients have us put together a guest signing album using their engagement images. We have hard paged albums where we put the engagement photo on one side of the page and leave the other side blank for guests to sign at their wedding reception. Of course, if you live out of state or are eloping, an engagement session probably won’t work for you. What is on my nose? Now to continue where I left off in the last post. If the girls are getting their hair and makeup done, I try to keep everything on schedule by letting them know how much time they have left because it’s so easy to lose track of time and get behind. Sometimes we do a First Look with the bride and groom, which I find to be super special because we’ll have the bride walk up behind the groom and maybe put her hands over his eyes or tap him on the shoulder. He then turns around and gets to see his soon to be wife in all her beauty. After we take some photographs, which adds more to the couple’s collection, we let them be alone for a few minutes. This definitely does not take away from the way the groom reacts when he sees his bride coming down the aisle. If the bride and groom don’t want to do a First Look, sometimes we’ll do it with the bride and her dad. During the ceremony, both Ken and I take photographs of everything going on. We love to capture all of the smiles, the tears, the emotions, and any other moments that happen. Some couples have a special thing such as a sand ceremony, an exchange of roses, or something else special to them. This is one of the things we ask about in our Wedding Information form so that we’re prepared when it happens. We make sure to capture the vows, the ring exchanges, and the first kiss. Sometimes we have to yell out “slow down the kiss” so we can capture the moment – haha. Then as the couple is walking back down the aisle, I have them stop at the end of the chairs and do another kiss. This usually gets an applause from their guests. Stay tuned for Part 3 where I’ll talk about the portraits of the family, wedding party, and the couple. Posted in Engagement Sessions, Family Portraits, photography, Portrait Photography, Wedding Elopement Photography, wedding photography and tagged Durango CO Photographers, Durango Photographers, Durango Photography, Durango Wedding Photographers, Durango Weddings, Engagement, Photographers Durango CO, Photography, Photos, Pictures, Portraits, Wedding, Wedding Elopement, Wedding Photographers Durango CO, Wedding Photography Tips. Bookmark the permalink. My husband and I are Durango Photographers and Sarah and Bobby hired us to do their engagement session. They live in Durango, but unfortunately for me, they’re getting married in the Denver area, so we won’t be able to photograph their wedding. Bobby is a software engineer who loves dogs and cars. Bet you couldn’t tell that they both love dogs – haha. He loves to work on his car, racing cars, playing video games, biking, hiking, and kayaking. Wow, he’s a busy guy. Sarah is a full time student who loves dancing and art. She loves pole dancing, singing, and creating digital art drawings. I’ve seen some of her drawings and they’re amazing. They like to go for fun drives, take the dogs out to play, enjoying local restaurants, and having laid back time together. If you have a wedding, family portrait session, boudoir session, or high school senior session that needs to be photographed, get in touch and I’ll be happy to give you all the pertinent information that you need. Posted in Engagement Sessions, Fun Photography, Pet Photography, photography, Portrait Photography, wedding photography and tagged Durango CO Photographers, Durango Photographers, Durango Photography, Durango Wedding Photographers, Engagement, Love, Pet Photography, Photographers Durango CO, Photography, Photos, Pictures, Portraits, Wedding, Wedding Photographers Durango CO. Bookmark the permalink. My husband and I photographed Laurie and Chris’s engagement session along with their fur baby, Rico. Rico is a little young and very active – it was not easy to get him to sit still. It’s like trying to get a toddler to stop moving for a few seconds – haha. I had made a sign for them so Rico could announce their engagement and wedding date. We propped it in front of him and he leaned over to read it. While reading it, he drooled right down the chalk board. Luckily, it ran between the words. Both of them work for the US Forest Service in the Bayfield CO office. Laurie is an administrator in the office, and Chris is a wildlife biologist. They are both great, loving, and fun people. Chris put his biology skills to work by naming the type of squirrel that had left a pile of poo on the rock they were going to sit on, then he promptly brushed it off. Laurie plays the bagpipes in a Celtic group and Chris loves to bird watch. They both love to hike, have 3 dogs, and one cat. The cat is the boss of the household. I understand that perfectly because we have a cat as well. They were married at Ridgewood Event Center in Durango on 6/21 and I’ll be posting their wedding photos soon. Posted in Engagement Sessions, Fun Photography, Pet Photography, photography, Portrait Photography and tagged Durango CO Photographers, Durango Photographers, Durango Photography, Durango Wedding Photographers, Engagement, Pet Photography, Photographers Durango CO, Photography, Photos, Pictures, Portraits, Wedding Photographers Durango CO. Bookmark the permalink. Yes, A Snake – a bull snake to be exact. We were up at the Lion’s Den near Ft Lewis College in Durango CO, and just as we were leaving a bull snake came slithering by our feet. We all jumped a mile, and then Matt said “do you want to take a photo with us holding the snake”, and I said “hell ya”. So he picked it up behind the head and they had a great time, and then wanted to take him home. Kristie’s mom and dad were with us and they vetoed that idea – haha. We also went to the little park by the Chapel just down the road from Lion’s Den and had a fun time with Matt throwing Kristie over his shoulder, then doing a piggy back ride, and them sitting on the bench overlooking the town. We went to the river and did some photos with them sitting on rocks, and to another small park where there’s a creek running through it and they sat on a log and a park bench. They’re getting married in September at Dalton Ranch Golf Club. They signed up for that venue at the Wedding Expo back in January. I had the booth right next to them, but Kristie doesn’t remember meeting me there. Here mom just happened to contact me by phone after a google search for durango photographers. So happy we got together for their engagement session and their upcoming wedding. Posted in Engagement Sessions, Fun Photography, photography, Portrait Photography and tagged Durango CO Photographers, Durango Photographers, Durango Photography, Durango Wedding Photographers, Engagement, Love, Photographers Durango CO, Photography, Photos, Pictures, Portraits. Bookmark the permalink. This is the cover and a few pages from Lexi and Michael’s Engagement Album. It is also a Guest Signing Book for the wedding day. Their wedding guests will be able to sign their names, leave their congratulations, and send their love to the couple. These guest signing albums are amazing keepsakes and since they are professional high quality pages that are thick and lay flat when opened, the coffee table is the perfect place to display it for everyone to look through. I’m excited to photograph their wedding next Saturday and then they’ll have a Wedding Album, which will be more pages and larger than the engagement album, so they’ll need more room on that coffee table. Posted in Engagement Sessions, Fun Photography, photography, Portrait Photography and tagged Durango CO Photographers, Durango Photographers, Durango Wedding Photographers, Engagement, Love, Photographers Durango CO, Photography, Photos, Pictures, Portraits, Wedding Photographers Durango CO. Bookmark the permalink. It’s wedding season here in Durango CO, and pretty much everywhere, so I’ve attached a pdf file of suggestions for your wedding planning if you’re getting married, or if you know someone who is getting married. I know when you are getting married for the first time, there are so many things you don’t know (I remember that time). I’ve been the photographer at so many weddings now that I have learned a lot of things most first time couples would really appreciate knowing. I hope you will find these tips useful. Feel free to comment any other suggestions you may have, or questions you have on the items I have listed. Thank you for reading my blog. Let me know what you think. Posted in Engagement Sessions, photography, Portrait Photography, Wedding Elopement Photography, wedding photography and tagged Durango CO Photographers, Durango Photographers, Engagement, Makeup for Wedding Portraits, Photographers Durango CO, Photography, Photos, Pictures, Portraits, Wedding, Wedding Photographers Durango CO, Wedding Photography Tips. Bookmark the permalink. 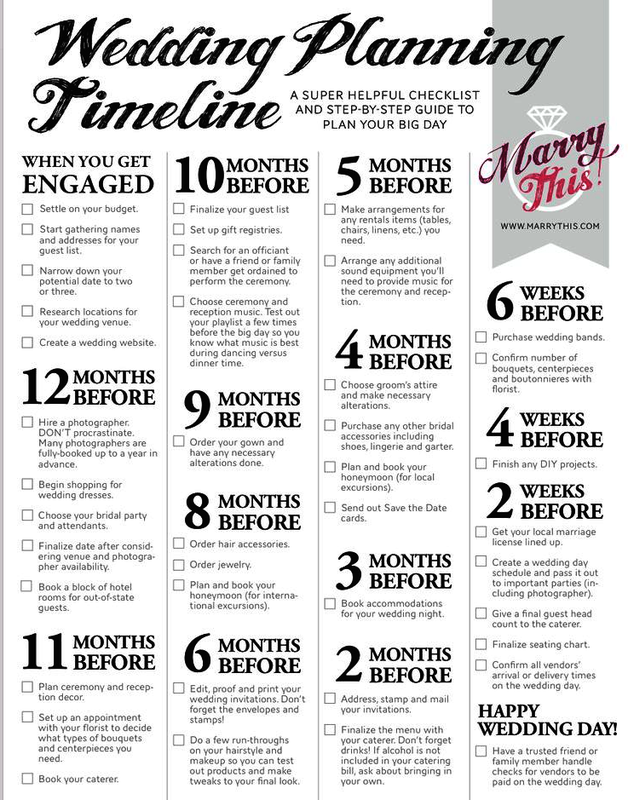 I found this awesome Wedding Planning Timeline on Pinterest given to us by Marry This. Most couples planning a wedding have never been married before, so this is super helpful information. I think it also helps bite that procrastination bug right in the behind, if you know what I mean. The only change I would make is to add doing an Engagement Session 5 months before so you can use one of those images for your Save the Date cards, and also have a guest signing book made using your engagement photographs. These are super popular with my wedding clients. Another thing to think about when booking vendors is that they want to be able to plan their summer vacation, so if you wait until a month or two before your wedding, they may already have set your date aside to be gone. Vendors appreciate having the dates booked way in advance so they can do their own planning. You can feel free to share this with anyone you know who is getting married. Posted in Engagement Sessions, wedding photography and tagged Durango CO Photographers, Durango Photographers, Durango Wedding Photographers, Engagement, Photographers Durango CO, Photography, Photos, Wedding, Wedding Photographers Durango CO, Wedding Photography Tips. Bookmark the permalink.